Elaborate your starter however you choose, but ending up with the same flour, puree, and water weights. (or make a commercial yeast preferment) Allow it to rise overnight. The next day cream the starter with the water and puree for the recipe, then add in the oil. Lightly dust your counter or work space with flour and scrape the dough out. With lightly floured hands, give the dough a stretch and fold and then flatten it out into a rectangle. Add the berry mixture on top of the dough, then give it a fold or two and some gentle kneading to incorporate the berries. You may need to add quite a bit of flour if the berries get squished in the kneading and release water (I did). Very gently grab loaves rising on a towel, and move them to a peel with flour, cornmeal, or parchment paper. If using brotforms, just invert the loaves onto parchment or a peel. Just before you load the loaves into the oven give them a few shallow slashes. Load the loaves into the oven and carefully pour about a cup of the hot water into the steam pan. Be careful of the window and light bulbs in your oven. Bake for 10 minutes, turn loaves 180 degrees and remove parchment paper if using. Continue baking for another 10-20 minutes (depending on shape), the loaves should sound hollow on the bottom when complete. Remove finished loaves to a cooling rack and let sit for at least 1 hour before cutting. So, the puree gave me a bit of trouble with being lower moisture, and the raspberries proved to be a bit too fragile and made the dough a bit overly moistened. 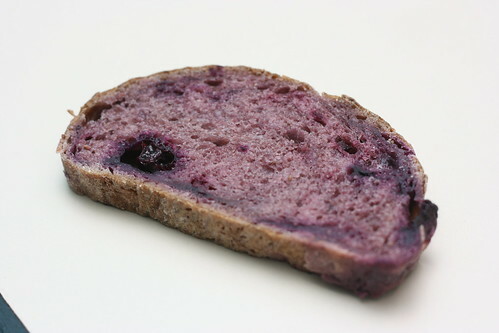 But it all turned out worthwhile, because this bread is so full of berry flavor that it tells forest berry jam to get lost! It turned out very moist, full of flavor, and a nice dark color from all the berry puree. Blueberries and Blackberries work the best as whole fruit in the dough, the Raspberries are just too fragile and Strawberries are frequently too large to integrate well, and just get dried out when sliced. All stuff to take into consideration for the future. Well, this is my submission for YeastSpotting this week, and it should have pictures by the weekend! Wow! You are perfecting this one pretty nicely. Please pass the butter! !